A School of Engineering and Applied Science researcher is developing a carbon- and nitrogen-based material that could have significant public health implications. The material could be used to purify water through solar energy, destroy potentially harmful germs on hospital surfaces and inactivate foodborne pathogens that can grow in food. The material is a graphitic carbon nitride powder made by combining organic chemicals in a pressure cooker-like machine called an autoclave, or another oven-like machine. Danmeng Shuai, an assistant professor of engineering who focuses on nanotechnology, makes the material in his Science and Engineering Hall lab. The result is a photocatalyst, a material that can be used to harvest light and has a disinfecting effect that could have a significant impact on public health. When sunlight or indoor light interacts with the material, it creates a reaction that inactivates organic contaminants and pathogens that cause disease or illness, Dr. Shuai’s research shows. The material can be used to purify water in rural areas with little access to water treatment facilities or in the aftermath of a natural disaster. It could also be used as a coating for self-cleaning surfaces for food processors and packages and in hospitals, and prevent the spread of germs, Dr. Shuai said. Dr. Shuai’s lab has been focused largely on water purification applications and published a paper in November on the research. Pollutants like agrochemicals, pharmaceuticals and personal care products can contaminate the water supply. These chemicals are typically rooted out in water treatment plants but can still be consumed by people who rely on water pumped from wells. Rural Americans could purify the water coming into their homes through a system that uses graphitic carbon nitride material, Dr. Shuai said. During water treatment the material can be immobilized on a transparent tube or flat surface, and water would be purified when it passes over the area. Preliminary toxicity studies have shown the material is not toxic to microorganisms or humans, and it would not be consumed during the process. A photocatalytic water purification system, based on graphitic carbon nitride, for in-home use could be available within the next decade, Dr. Shuai said. The lab has applied for a patent on the material. 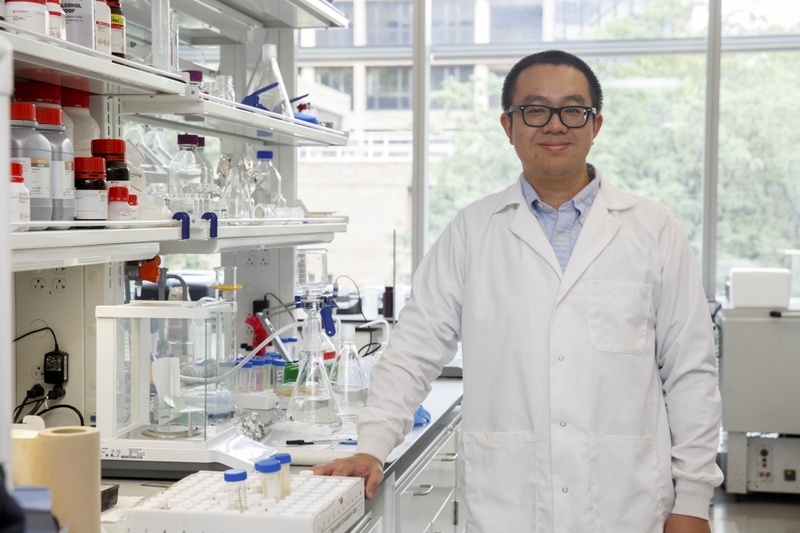 Other researchers have been studying graphitic carbon nitride photocatalysts since 2009, but Dr. Shuai’s lab is ahead of the curve in using it for an engineering application to solve contamination and environmental challenges, he said. Dr. Shuai and his team recently published a paper evaluating existing research in this field and providing opinions on where future research should be done. GW doctoral students Qinmin Zheng and Hongchen Shen were also authors on the paper. Dr. Shuai’s work is sponsored by the Agriculture Department and the National Science Foundation. The material also could be used as a surface coating in hospitals, Dr. Shuai said. His lab is studying how graphitic carbon nitride can be used to automatically kill pathogens growing on door knobs and tables under indoor lighting. This reaction between the oxygen and indoor light would mean staff could spend less time sanitizing surfaces with disinfecting chemicals. Some medical facilities use UV lights to disinfect patient rooms when they are unoccupied. This requires costly installation and UV exposure has negative health effects that could lead to cancer. Using a photocatalyst coating would be a better long-term solution, Dr. Shuai said. Surfaces coated with the material should retain their disinfecting properties for years and have a significantly longer lifetime than chemical cleaners. When a surface is scratched or covered by dust that blocks the light it will eventually lose some functionality, Dr. Shuai said. Researchers are also exploring how the material can be used in food packaging. Earlier this year, Dr. Shuai and his colleagues Santiago Solares, an engineering professor, Hanning Chen, an assistant professor of chemistry, and Ganhui Lan, a biophysics assistant professor, were awarded a $450,200 grant by the Agriculture Department. GW researchers will conduct a three-year project on antimicrobial materials for safe food processing and packaging. The lab also has started using the material to create a common disinfectant that can curb infection. The graphitic carbon nitride provides a platform for water to react with oxygen in the air to make hydrogen peroxide. This could be useful in places where access to medical supplies is scarce, Dr. Shuai said. Nanotechnology development is fundamental to the future of public health, Dr. Shuai said. “Everyone cares about having clean water and good health,” he said.